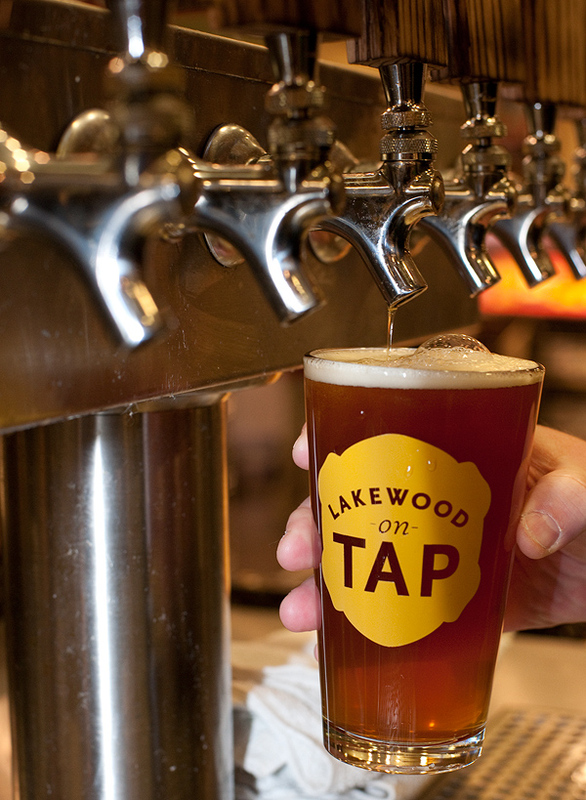 Lakewood on Tap allows a woman drinking alone to feel comfortable. The woman sitting next to us at Lakewood on Tap was happy to pass in and out of our conversation, the way someone might chat with you in a grocery store line or in a little cafe. She struck me as a little lonesome—the way we all are sometimes—and needing a moment of kindness from strangers. The woman pouring drinks was kind. She had a warm face and an easy way of moving that reminded me of some of the most loved neighbors in my own neighborhood. It’s not easy to be a woman by herself in a bar. It’s just not done, at least not often. There are a thousand reasons for this, all of them complex and intricately tangled together, the way gender issues are. (It may not be easy to be a guy alone in a bar either, but I’ve seen that a fair number of times.) I’ve been writing about bars off and on since 2001. In all those years, I’ve probably gone to a bar by myself fewer than two dozen times, always for work. In all that time, I’ve noticed women alone in bars maybe three times altogether. So when I’m in a place where I see a woman alone who feels comfortable having a drink and dropping in and out of conversation, I notice. At Lakewood on Tap, I noticed. Lakewood on Tap is an easy, comfortable space to be in, partly because it’s not a bar in the usual sense. The physical space is small and fairly bare, set in the middle of grocery aisles, the way a winery might have space for tasting between steel vats and giant barrels. 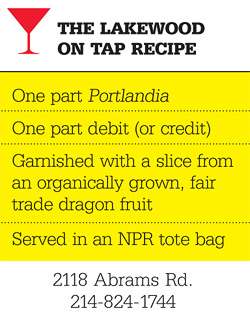 It offers features you won’t find at a regular bar: growler refills, for example. A concierge who’ll hang onto your grocery cart while you stop in for a glass of red wine (or, for a fee, get everything on your shopping list for you). There are usually eight independent craft beers on tap, a couple of which change daily. There are 10 to 15 wines by the glass, four of which are on tap and two of which are usually local. The wines rotate monthly. In as much as it felt like a tasting room, Lakewood on Tap also felt like a cafe. Tall tables, people reading and hanging out, having snacks and light meals. On my Thursday night visit, most people, though not all, looked really healthy and upper middle class, like they belonged in a yoga studio. Apparently a group of cyclists makes the bar its last stop on its way home. Lakewood on Tap feels like a meeting place, a hangout point. Which was the goal. Whole Foods wanted to have a neighborhoody place. One of the reasons to love neighborhood places is that, at least in theory, it’s easy to talk to people. Back when I was a bar columnist in Austin, I went once to a neighborhood dive that opened at 8 am, sat at the bar, drank a soda (I couldn’t manage a beer at 8), and had a conversation with a train engineer who’d just gotten off his shift. We talked without expectation of anything else, without hope of anything else (well, he might have had a glimmer of hope). But it was easy, easy to be a woman sitting in a bar, talking to the guy who happened to be sitting next to me. I have never been able to come up with any hard and fast rules about what works in a bar. And as for gender issues, despite lots of time spent thinking about them, I don’t have any really good rules of thumb for that arena either. All I know is that doing what isn’t usually done is hard­—having a drink by yourself included. Lakewood on Tap is a bar that’s closer to a neighborhood cafe. But it’s in a grocery store, under grocery store lights. There’s something forgiving or familiar about that, something easy. Something that perhaps made it comfortable for the woman next to me to sit on a stool by herself and have a glass of wine and conversations with strangers.